Reading this month’s cover story, one cannot help but hear echoes of it in today’s news, specifically the Occupy Wall Street protests that have been taking place since September. Baruch Hashem – with an emphasis on Hashem – the British people literally stood up to them, and the rest is history. But how scary it is that even those we counted as our allies were so close to siding with the likes of Hitler. Of course, although anti-Semitic slurs have been documented, today’s Occupy Wall Street is nothing like London 1936. Nevertheless, that it even exists at all illustrates how fragile our sense of security is, reminding us how thin the barrier is between the Dr. Jekyll and the Mr. Hyde of the Gentile world. This serves as a paradigm of the prophetic vision for the end of time, Milchemes Gog Umagog, the “War of Gog and Magog,” the ultimate conflict between good and evil. Before Mashiach succeeds, the armies of Gog and Magog will join forces and war against Klal Yisrael. It will be a terrifying time, but Gog and his collaborators will be vanquished, and the long foretold era of peace among nations will be ushered in. The identification of Gog and Magogis complex, however as Rabbi Moshe Eisemann explains in his brilliant analysis (Yechezkal, Chapter 38; Artscroll) Gog is an individual from the arch-enemy of the Jews, Amalek (from Noach’s son, Shem), who will rise to power amidst the people/culture of Magog(from Noach’s son, Yefes) and incite them against the Jews. Yefes, which means “beauty,” is the forerunner of Greece, the foundation of Western civilization. Beautyis morally neutral. It can inspire to good or intoxicate to destruction. Yefes can place his gifts at Amalek’s feet as readily as he can subordinate them in the service of holiness. Milchemes Gog Umagogrepresents a tug-of-war that has replayed itself throughout history. When good people prevail the forces of Yefes become vehicles for light. When they slacken the dark side takes them over. Despite Amalek/Gog’s apparent power, he only exercises it according to Hashem’s will and in accordance with the spiritual stature of the Jewish people. An external event – political, military or otherwise – reflects our internal state. The cover story this month illustrates that poignantly. May we take it to heart and focus on internals before externals. 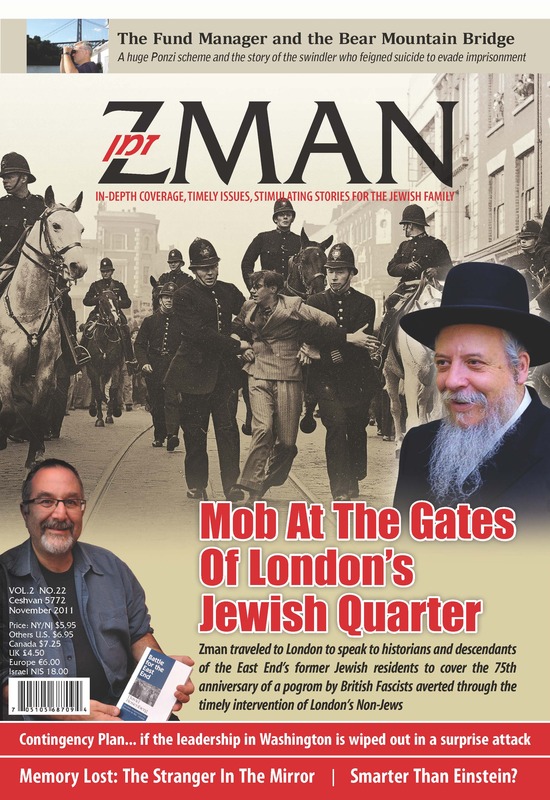 This entry was posted in Zman Magazine and tagged 1936, anti-Semitism, fascist, Jewish history, Jewish Quarter, London, London's East End, mob, Mosley, Occupy Wall Street, pogrom, riot, Zman, Zman Magazine. I am in the middle of a major project for Rabbi Berel Wein‘s organization, The Destiny Foundation. In the late 80’s Rabbi Wein put together, over a period of four years, 116 tapes on Jewish history. They quickly became a classic and touched all types of Jews from the very uninformed to the most scholarly. I plan to create a new blog with a name like “A Taste of Wein” or “A Sip of Wein” which will excerpt from chapters I am currently working on or have worked on in the past. If you sign up for an email subscription to my blog you can receive these automatically as I post them (after I create the blog). 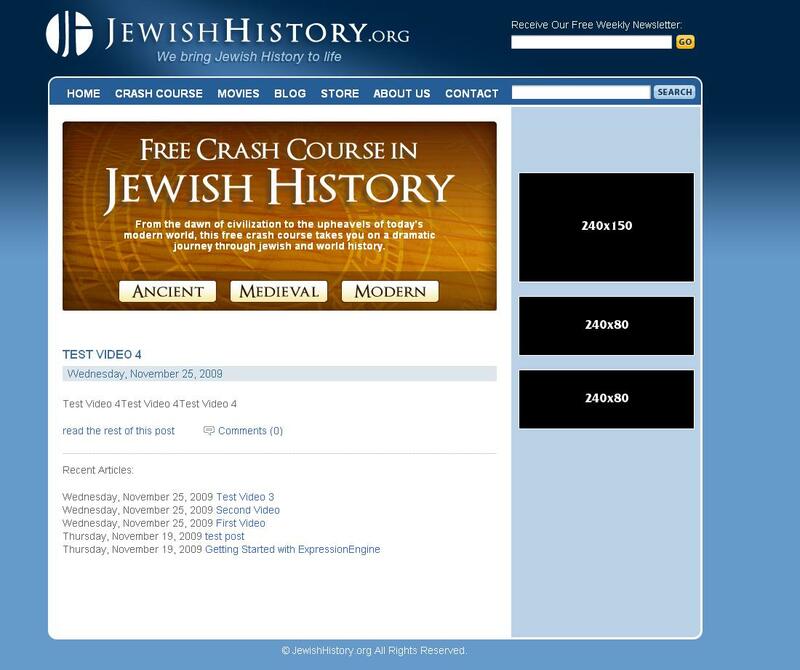 This entry was posted in History, Jewish History, Rabbi Wein and tagged Jewish history, jewishhistory.org, Rabbi Wein.